The Congress on Monday accused Prime Minister Narendra Modi of indulging in "petty politics" by talking of Emergency during his monthly radio address 'Mann Ki Baat'. "How do you do 'Mann Ki Baat' on Emergency that happened in 1975-76? Why do you talk about it in 2016? What is its relevance today?" 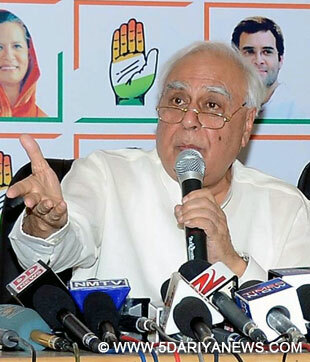 Congress spokesperson Kapil Sibal told the media at the party headquarters here.Sibal said Emergency can no more be imposed on grounds of internal disturbances, as was the case in 1975. "Under Article 352, you could declare an Emergency on grounds of internal disturbance. That article has been taken away by the 44th (Constitutional) Amendment. Why are you talking about Emergency now in 2016 except for petty politics?" the Congress leader said. "You can't have an Emergency on grounds of internal disturbance now and yet you do 'Mann Ki Baat' because you are internally disturbed," Sibal said in an obvious reference to Modi. "There is farmers' emergency, drug emergency, unemployment emergency and price rise emergency. Deal with those emergencies. You are more interested in 1976 in 2016 and not dealing with the emergency that is on hand," the Congress leader remarked.Referring to statements made by senior Bharatiya Janata Party leaders L.K. Advani and Arun Shourie and former party leader Pradyut Bora, Sibal said there is a silent emergency already in place. "Today, the Minister for External Affairs barely knows that the Foreign Secretary is about to get fired. The cabinet ministers can't even appoint their own Officers on Special Duty. Power is centralised in the Prime Minister's Office. It makes me wonder if a cabinet system still exists in this country," the Congress leader said.Pointing to a statement made by Bora, Sibal said he was mortified to see that no cabinet minister, BJP office-bearer or party MP had shown the courage to question Modi on the subversion of a fine democratic tradition. "If such a situation continues, there will be Modexit in India in 2019," Sibal quipped while referring to the exit of Britain from the European Union.